Heat 2 tbs oil over medium-high heat in a cast iron casserole or large pan until shimmering. Season half of chicken with salt and pepper and add it to pan. Cook, turning pieces occasionally until well browned, about 15 to 20 minutes. Transfer browned chicken to plate and repeat with remaining chicken. Discard all but thin layer of fat from pan. Add leeks to pot, stirring and cooking until softened, about 4 minutes. Add the Riesling and chicken stock. Turn to high heat to bring to boil, scraping the brown bits from bottom of pan. Turn heat to low and return chicken and any juices to pot and cover and let simmer 20 minutes. Melt the butter in a large skillet over medium heat and cook until it turns brown, 1 to 2 minutes. Add the mushrooms, season with pinch of salt and pepper. Stirring occasionally until mushrooms are softened and browned, about 10 minutes. 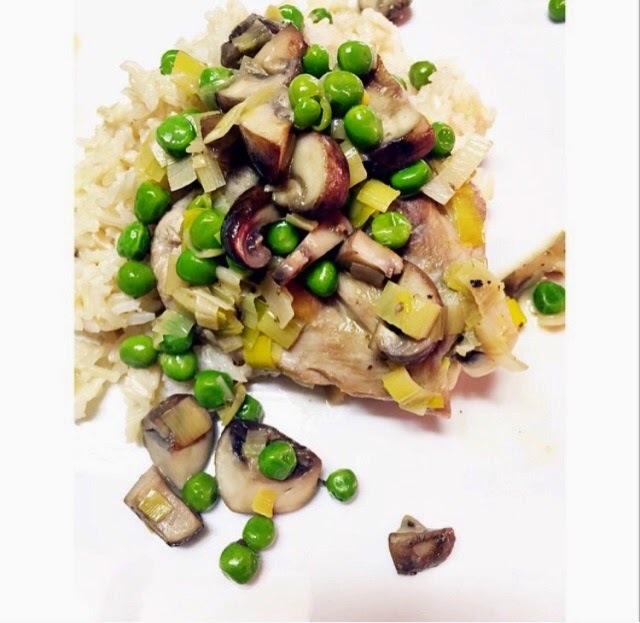 Transfer mushrooms to casserole dish with chicken add cream and peas. Stir all together and cook until peas are hot and bright green, about 3 minutes.